I’m sorry that I’ve been away. As I mentioned in a brief Facebook post last week, I’ve had parental care responsibilities that required my full attention, mostly out of town. After two weeks amid the peculiar, punishing, and expensive late life American health care system, I can begin to resurface a little. With any luck, my resurfacing will last; but there are no guarantees in life. Today is a good day to check in with you. It’s Super Bowl Bowl Sunday — the three-year anniversary of Polk County’s Starbucks Revolt. I always to try to take a moment on this day to celebrate and assess. Fair warning, one header below has a moment of PG-13 language. Three Super Bowl Sundays ago, Wendy Bradshaw and I held an impromptu public meeting at high noon at the Lakeside Village Starbucks in Lakeland to organize around removing then Sup. Kathryn LeRoy from office. I had hoped that 10 people would show up. We got about 90, representing both public education professionals and the public. It is impossible to know for certain; but I have always thought that Kathryn LeRoy would still be superintendent today if the public had not organized that day to begin taking back our school system. It wasn’t just LeRoy’s abominable behavior we challenged; it was the toxic mix of incompetent leadership and punitive consequences for everyone suffering underneath her. Since then, larger scale teacher and educator revolts have happened all over the country — built around that same toxic brew: incompetent, highly paid leadership at all levels imposing punitive consequences onto underpaid staff doing the work on the ground. Many of these revolts happened in “reddish” states like West Virginia, Kentucky, Oklahoma, and Arizona. In that way, they very much echoed what happened in “reddish” Polk. Crucially, the public in those “reddish” states have sided emphatically with teachers — and other people who do the work. There is a new Polk School Board in town. You, dear voters, put it there. Here in Polk, that public movement has continued. It carried veteran teacher Sarah Fortney and ground-level ESE activist Lisa Miller to emphatic victories in their 2018 elections. Sarah Fortney beat my 60 percent with 61, a tip of the hat that I proudly offer. As a result, your Polk County School Board has changed profoundly, in conjunction with your wishes as voters. This board is challenging senior staff leadership to justify and explain its actions. It is asserting its will in policy-making. And it is rejecting the absurd notion that they are only two options for a board member in addressing staff leadership performance — fire the superintendent or do nothing but clap louder. That’s always been a false choice; it’s falser than ever today. You see this new attitude and approach in the board’s pushback on the ill-conceived and poorly-articulated busing and transportation plan. I should be clear that I believe the responsibility for the direction and roll-out of this plan lies with the superintendent’s office — not transportation or public relations. I think all staff, essentially, operates with very limited freedom right now, which is a problem. Indeed, to be very frank, senior staff leadership, starting with the superintendent, are struggling to adjust to this new board paradigm that you, the public, have chosen. In my observation, the superintendent imposes very, very, very tight constraints on the people who work for her. She doesn’t trust her people nearly enough. That’s a mistake. It’s hurting her leadership and hampering her many strengths. I have urged her privately and publicly to change that approach. No one person can exert the level of personal control over 13,000 staff members and 104,000 kids in a $1.4 billion organization that the superintendent seeks to exert. No successful CEO or organizational leader operates that way. This is a giant knowledge organization; it requires some entrepreneurial freedom to thrive. For the first time in a generation, Polk senior staff is working with a School Board that demands staff collaboration and problem-solving — and will continue to do so. The staff, starting with the superintendent, needs to respect the public’s will enough to meet the public and its School Board at least half-way. That’s not happening right now. Right now, your top staff treats your School Board like an annoyance to be avoided or parried. That means they treat you, the public, as an annoyance. That should not be acceptable to you. It’s not acceptable to me. My focus, moving ahead, as one board member, is to use the strategic plan process to end this siloed relationship between board and staff — and bring about meaningful collaboration. The strategic plan is how your School Board, acting on your behalf, decides to evaluate organizational performance and the superintendent. Right now, the core measures for leadership evaluation are easily-gamed, often inherently-fraudulent numbers — like school grade points and graduation rate. They measure virtually nothing about organizational health, leadership quality, or true educational experience. In fact, this is one area in which I’m optimistic about collaboration with fellow Board Member Kay Fields, who won re-election. In past discussions, Kay expressed skepticism about the merits of making “becoming an “A” district” our top strategic goal. I could not agree with her more. It’s a stupid goal, built on a fraudulent measure that we cannot control at the district level. I am happy to keep some meaningful data measures in an “Academics” bucket. But it is imperative to the future of this organization that concepts like “leadership development”; “program implementation and problem solving”; “work environment”; and “equity” (across multiple dimensions, including ESE status) and “public transparency and honesty” become concepts that also determine the evaluations and salaries of our top leaders. Today, they are not — not in any meaningful way. The gameable numbers determine pay and job security, not the more complex and more vital elements of a high quality educational experience. Evaluating senior staff, meaningfully, by their performance in these areas does not add anything to anybody’s plate. Ask senior staff and they will tell that they are already doing things that roll up to those concepts. Indeed, we recently had an implementation of a major new student information system called “Focus.” The quality of that implementation was not evaluated by your old School Board in any way. In fact, I was the only board member who repeatedly asked about its progress. And yet, it had profound impact on every student and school-based educator in the district. To ignore it as a thing to evaluate is insane. If your School Board adopts the enhanced strategic plan that I envision, we’ll simply begin to hold leadership accountable for what they’re already doing — and how our people on the ground experience their leadership. That’s a simple administrative change — but a radical cultural change. It’s what we need. I step away for a couple of weeks and Ron DeSantis rips the rhetorical foundation of the entire fraudulent Florida model out from underneath everybody. I literally giggled out loud to myself while standing in the parking lot of a rehabilitation hospital in Jacksonville. It was the first laugh I’d had in a week. If there was ever a moment to go, ¯\_(ツ)_/¯, that was it. People are rightly debating the educational and operational meaning of throwing out/remaking “Common Core” in Florida. In the most literal sense, Common Core-based standards still form the bedrock of Florida’s stupid, fraudulent, and oppressive testing/school grade regime. There’s no way to know right now what the DeSantis announcement actually means to a student or educator’s life, much less if it will make either better. The governor may throw out nothing but noise — and build nothing but pain. However, the focus on mechanics misses the true importance of what just happened. Just a few weeks ago, 15-minute lunch Pam Stewart declared this her way out the door. DeSantis, with the open blessing of Corcoran, apparently, just said: “That’s utter hogwash.” And he is correct. You don’t rip out your standards if your model isn’t broken. I cannot predict what comes after this; but you can’t unring that bell. DeSantis can’t unsay what he’s been saying; nor can Corcoran. The return of politics to education is healthy. And the Teacher Party has power. I can’t tell you the policies won’t get worse and more oppressive. But I kind of doubt it. The #silentstrike of the teacher shortage and the general hatred of unnecessary testing as an educational experience are beginning to emerge as voteable issues in democratic (small-d) politics. It’s become a powerful political liability for people unwilling to change. “Testing” is the new “taxes”. READ. MY. LIPS. So this is a political move, not an educational one. And that’s good. People for a generation have pretended there are no politics in education, especially in Florida. But no politics actually means no real public input. Today, the consent of the educated is beginning to matter again. In DeSantis, we have a politician responding to public discontent with the Test-Punish-Fraud model of education. The governor, and his supporters on the political right, label “Test-Punish-Fraud” as “Common Core”; but it’s the same thing. I wrote about the metaphorical and political significance of Common Core here — and how it helped elect Donald Trump, who bludgeoned Jeb with it in the 2016 primary. DeSantis might as well have declared: “Billy’s right.” He might as well have stood up and said “the Jeb Bush era is over.” Jeb was an acolyte of Common Core, in its original pure form. And he’s the true architect of every experience people have come to hate in this state’s schools. He’s the architect of the teacher shortage. There is no running from that. You can tell by the defeaning silence of Jeb World in response, which the great Sue Woltanski has noticed. For the first time in 20 years, your state government has told you the truth about your state education system: it’s broken; and it’s hurting your kids. Now would be a great time to seek out Pasi Sahlberg or Ted Dintersmith. I had a few thoughts last year about the form a real review of the Florida Model might take. Check it out here. I’m going to come back to my own feelings about standards — and what we actually mean by that word — in a future article. It’s a little too complex for this high level review of the state of things. However, in my ideal world, we would reduce standards by at least 75 percent. We would simplify them — and build them around observable performance, not bubble sheets. We would build them to facilitate meaningful relationships with content, modes of thinking, and habits of practice. For instance, whatever our standards are now for foreign language performance are irrelevant. Very very few kids who are taking a foreign language from scratch in American schools are becoming practically proficient in that language. That’s because, for the vast majority of people, acquiring a new language requires immersion and constant habits of practice — preferably at an early stage in development. We have not prioritized that as a country or state. “Speak Spanish fluently” is an example of a good, aspirational standard. How you get there is what matters. And who gets punished if you don’t? 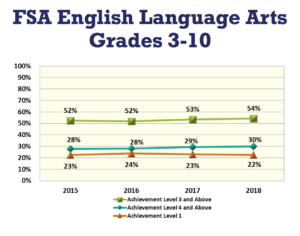 My favorite example of the absurdity of Florida standards comes in comparing Language Arts scores with Civics scores. Take a look at the images that follows. Florida asks you to believe that only 54 percent of kids can read proficiently; and 22 percent are at the lowest level, which means…what exactly? I don’t know. 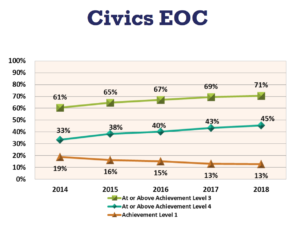 Florida simultaneously asks you to believe 71 percent of those same kids can read proficiently enough to reach proficiency on the Civics test, which is, at heart, a reading comprehension test. And only 13 percent are at the lowest level, which means…what exactly? I don’t know. Which means…what exactly? I don’t know. I have never been less sure of what the next year holds in Florida education than I am right now. And that is a good thing. Because for the past 20 years, I’ve been pretty sure we could expect greater pain. Now I don’t know. I have no idea what’s coming out of our Legislature this year. As the rotten structure of Jeb World crumbles, a million different people are saying a million different things. I see opportunity and peril. I’m choosing to focus on opportunity. In Polk, specifically, we have a chance to turn two perils into an opportunity. The community and staff division between Lake Wales Charter schools and Polk District schools disrupts not just Lake Wales, but the entire east side of county, including Winter Haven. I wrote about that in this article and in this article. And because of the nature of Florida’s choice model, those divisions place enormous strain on district busing. They cause us to transport many Lake Wales kids out of Lake Wales when there are Lake Wales schools available to them. This is bad for kids and bad for taxpayers. We do this at a time that we’re told we’re struggling to get kids to school on time because of bus driver shortages and must cut service to vulnerable kids in special needs charter schools. I have thought from the beginning — and continue to think — that making Lake Wales charter schools into zoned schools (the schools of last resort for Lake Wales) is the only real solution to this problem. Lake Wales Charter already has the centrally located high school and four of the five elementary schools in the Lake Wales area. Zoning those schools would have an enormous positive impact on wasteful transportation costs. Perhaps we save enough to continue busing very vulnerable kids from special needs charter schools. The hurdle to this, in the past, has been the general sense that you can’t make a charter school into a zoned school by law. And that nobody really even wanted to explore that idea, except me. Well, that seems to be changing. The idea of applying zoning to Lake Wales charter schools is getting at least some traction with officials in the Lake Wales Charter system and in the Lake Wales community. We’re beginning to discuss the notion of what it means to be “a school of last resort” in Lake Wales — what it means to take and keep all Lake Wales kids, by default. Fully vetting this requires a longer discussion. I’ll be trying to write this out in the next week or so. But for now, the general concept of zoning LWC schools also has received an unofficial, preliminary blessing from Adam Miller, the director of choice/charter issues for DoE. I had reached out to him, as an individual board member, to ask his opinion. He was very gracious with his time and thinking. He was careful not overpromise; as am I. But I’m thankful to him for the good faith discussions. Maybe this is the point, dear reader, where you say: Billy, you can’t stand DoE. You tweet mean things about it all the time. In fact, your daughter and son-and-law gave a you a coffee mug that says something very impolite about DoE. And it’s one of your favorite possessions. But it’s also true that I care more about solving problems equitably and meaningfully than “beating” any perceived enemies. If DoE chooses to be helpful in finding real solutions, I will welcome the help and reciprocate with good faith. And I suspect that by announcing the Florida Model is broken, DeSantis has put DoE under a ton of pressure. We should use that to our advantage to build creative solutions to longstanding problems. And as a politician, let me say this: when I engage you, whoever you are, my primary goal is never to beat you; it’s to win you over. That sometimes requires me to destroy your argument mercilessly. It also requires me to respond in good faith and collaborative spirit when the opportunity presents itself. I am running for re-election in 2020. Ed Shoemaker plans to oppose me. You may disagree entirely with everything I’ve said here. And if you do, you will have the opportunity to vote me out of office. I have already filed for re-election. I had hoped, by this time, to have online contributions up and running. I had hoped to have written some sort of big announcement thing. But then life intruded, as it sometimes does. Just like it sometimes does for the teachers and staff who work with your children every day. I filed early so people would have no doubt about my intentions. I’m proud of my record; I’m proud of the public engagement I believe I’ve helped to build. But that entitles me to nothing. I take nothing for granted. I know that all of you will get to say what you think of how I’ve done this job. You will get to ratify or reject my approach in all its forms. Ed Shoemaker, who ran against me and Hunt Berryman in 2016, has already told me he plans to run against me in 2020. We had a very pleasant meeting about it a few weeks ago. Ed and I are friendly. I will be curious to learn what he and I disagree about. We’ve been pretty well aligned on big picture concerns about the overall Florida model of education and its abuse of teachers and staff. I happen to think I’ve been better a board member than he would have been; and that I’ll continue to be a better board member. But that’s just my opinion; and it’s not the one that matters. Yours is all that matters. And I intend to win you over. I believe wholeheartedly in political competition; and I welcome Ed to the race. I also intend to compete hard and with clarity. Indeed, the Starbucks Rebellion was built on the idea that the public deserves a say in the education of its children. It was built on the idea of a competing vision to that forced down our throats by the state of Florida for a generation. Keep competing; we’re starting to win. You’re a voice crying in the wilderness (that is Florida public education). Keep up the fight and don’t forget special needs students. Put me down for any future signs, T-shirt’s, bumper stickers, etc. Good news: Billy Townsend’s running for re-election to the Polk Co. School Board. Smart, bold, unafraid. I keep saying we need more elected officials with a brain and a spine. He’s got both. Bad news: the governor said he’ll end Common Core. If that doesn’t seem like bad news, remember the state doesn’t offer anything good for public education without asking for changes that damage it. I won’t speculate. We’ll have to wait and see.